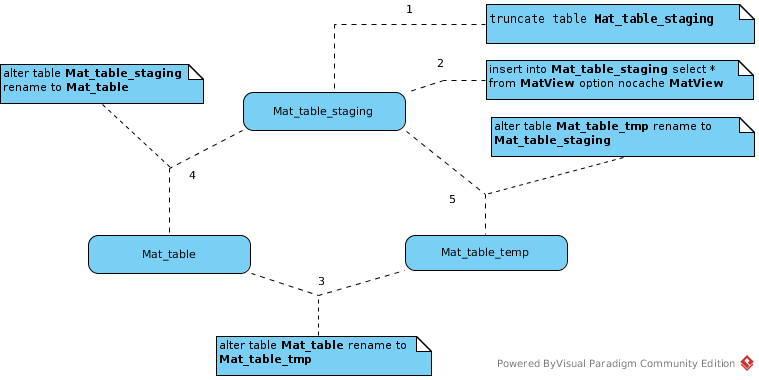 Teiid Materialized views are just like other views, but their transformations are pre-computed and stored just like a regular table. When queries are issued against the views through the Teiid Server, the cached results are used. External Materialization - External materialized views cache their data in an external database system. 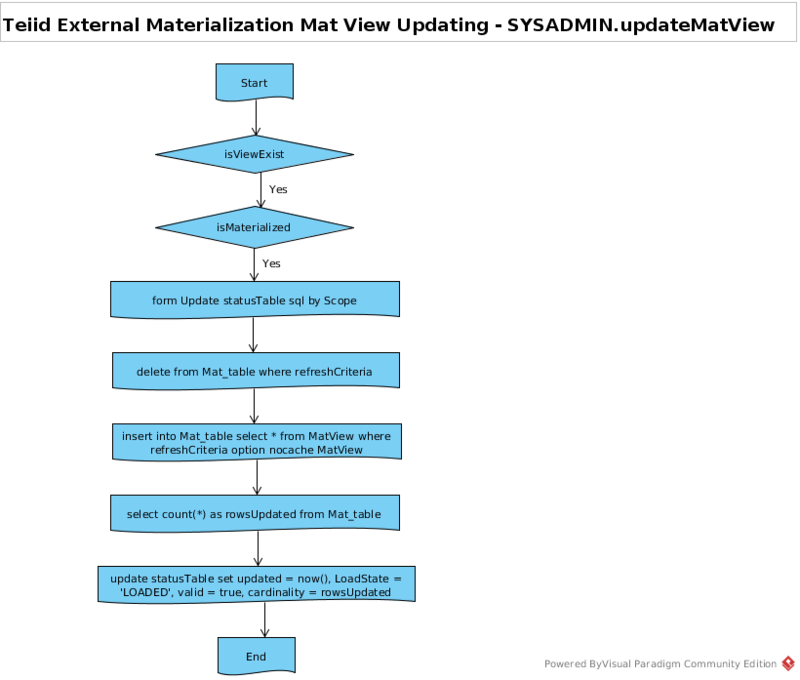 External materialized views give the administrator full control over the loading and refresh strategies. Internal Materialization - Internal materialization creates Teiid temporary tables to hold the materialized table. While these tables are not fully durable, they perform well in most circumstances and the data is present at each Teiid instance which removes the single point of failure and network overhead of an external database. Internal materialization also provides more built-in facilities for refreshing and monitoring. Detailed documentation from Teiid doc. 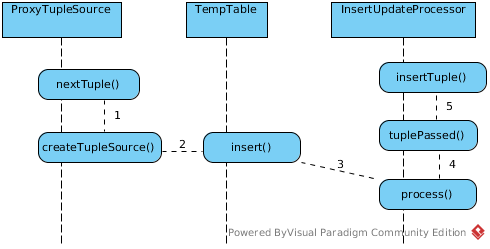 The MaterializationManager FinishDeployment judge Materialized View is Internal by MATERIALIZED_TABLE option, if MATERIALIZED_TABLE is set, the Materialized View is Internal. 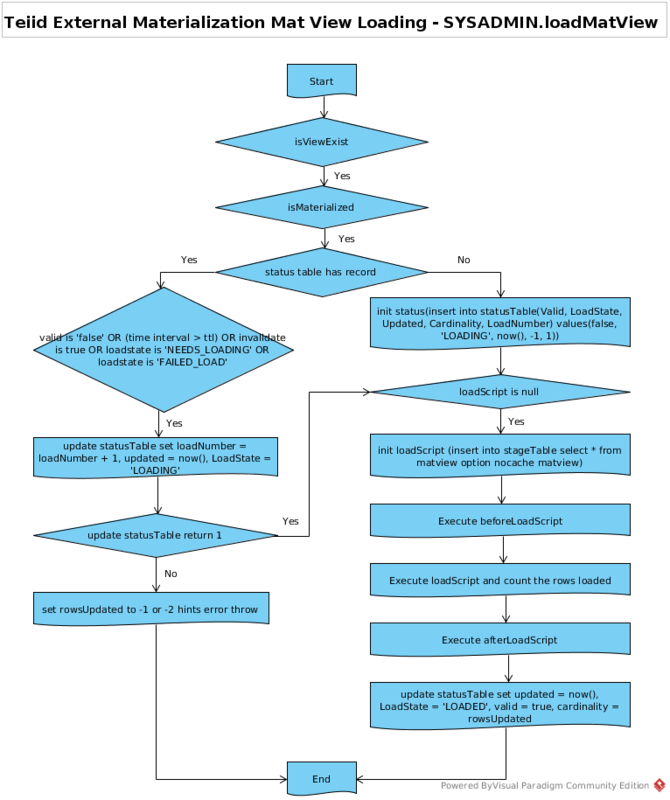 If teiid_rel:MATVIEW_TTL is not configured, or value <= 0, sql select count(*) from MatView pass to executeAsynchQuery(), and execute once. SYSADMIN.MatViews is a system tables, in this section we will look how System tables be queries in Teiid. As below figure, a Internal Mat View reference a Internal Local Temp Table. 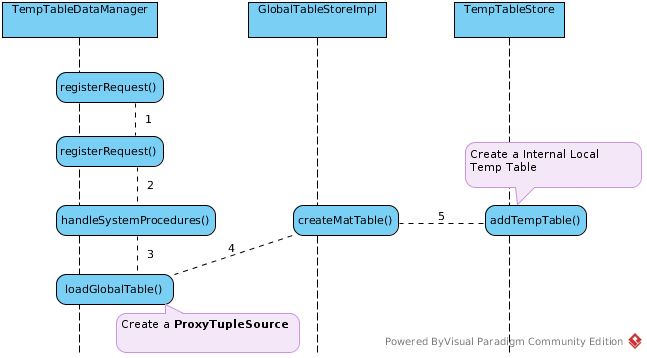 The syntax of name a Temp Table is add prefix #MAT_ to Internal Mat View, for example, #MAT_TESTMAT.SAMPLEMATVIEW is the internal temp table for Internal Mat View TESTMAT.SAMPLEMATVIEW. NOTE: At the end of updateMatView, Mat View’s status be updated(Valid -> ‘true’, LoadState -> ‘LOADED’, Updated -> now(), Cardinality -> rowsUpdated). Refer to MaterializationManager FinishDeploymen MaterializedTable != null section. 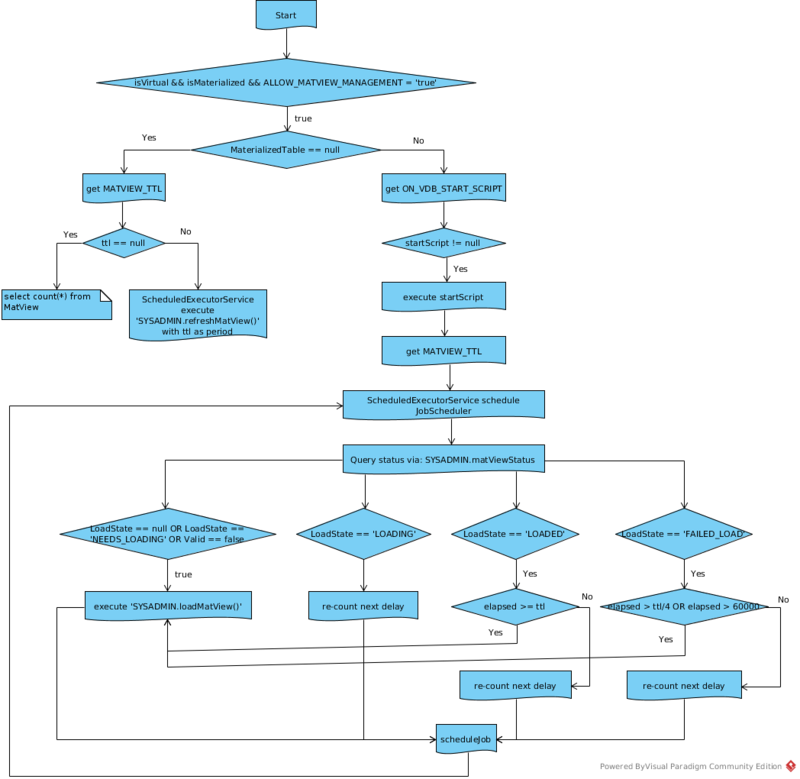 Set ALLOW_MATVIEW_MANAGEMENT Option to true is necessary if trigger Teiid ‘s aoto management. In Internal Materialization, any query against Mat View, or SYSADMIN.refreshMatView() will load MatView. This Section Contain Examples for both Internal and External Materialization.